In the Design tab on the menu bar, select Styles. Select Customize in the Styles pane to adjust a specific part of the currently applied theme, such as color, font choices, and the emphasis of animation. Tip: You can select Remix! 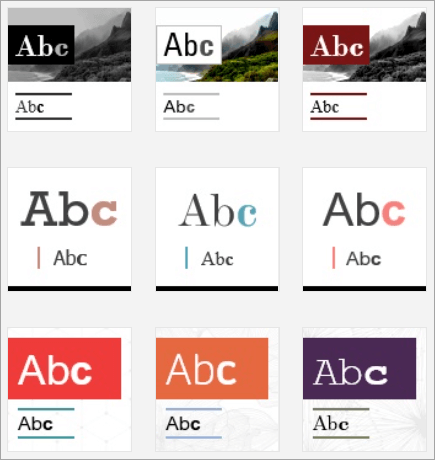 in the Styles pane to apply a random design to your Sway at any time. Select Remix! repeatedly until you find a design that suits your taste. Select the Design tab on the menu bar. In the Styles pane, select whether your content should scroll vertically, scroll horizontally, or appear like a presentation. When you preview your Sway, you can see how it will appear to others when you share it. Preview your work in progress at any time by clicking the Design tab. 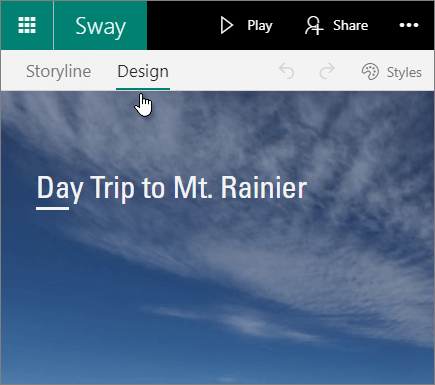 Select Play on the top menu bar to fully experience your Sway (including any interactivity options that you’ve added). It’s easy to share your finished Sways. Family, friends, classmates, and coworkers can see your creations on the web without signing up, signing in, or downloading anything. Select Share on the top menu bar. 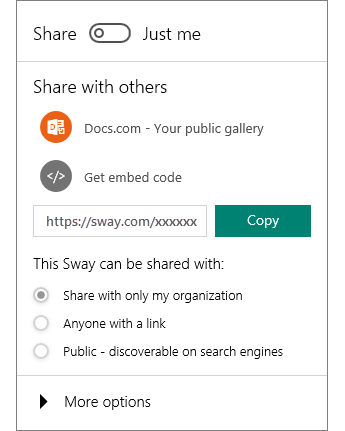 Select an option for sharing your Sway. Note: Your choices on this menu depend on the type of account that you used to sign in to Sway. You can change the privacy settings for any Sway whenever you want more control over what you share.